So, last month I joined the Lit-Flicks Challenge. From September until the end of February, the challenge is to read one book each month that has been adapted into a film. In order to get things started, Jessica at BlueStocking Society has started off with a meme. I usually am more likely to see a move if I know its been based on a book. I usually don’t find out that its been based on a book until after I’ve already seen the movie. I always say I want to read the book first, but I never get around to it, so I end up reading the book afterwards. Sometimes its nice have more vivid visuals to go with the book, ie, having Josh Hartnett in my head as I was reading The Black Dahlia, but other times, the visuals and time line with the movie aren’t in sync with the book and I get thrown off balance because I’m expecting something that isn’t there. Oo…this is a tough one. I liked the movie Atonement better than the book only because of the fantastic cinematography, set design and costumes. The book Neverwhere is a million times better than the original BBC series. The Black Dahlia was a pretty dead-on representation (excuse the pun). So was the first Harry Potter movie. Atonement was actually incredible accurate compared to the book. If you haven’t already, please check out Jessica’s page to join the Lit-Flicks challenge. There will be different activities each month, and lots of opportunities to win fun prizes. I have my list of books ready to go, but its all tentative depending on what the library has in stock. 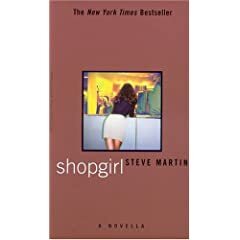 My selection for September is Shop Girl by Steve Martin. This entry was posted in Books and tagged Lit Flicks Challenge. Bookmark the permalink. Nari, great post! I love your answers to the meme. I’m going to read Atonement for the challenge. I agree about the first Harry Potter movie, but I thought it was a bit literal and lost some of the magic. Shopgirl is supposed to be excellent. I can’t wait for your review! I loved the book Shopgirl and enjoyed the movie too. Hi! I haven’t read any of those books, but I will definitely keep them in mind.